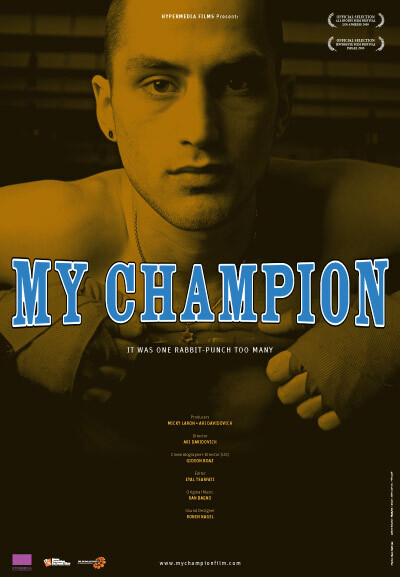 With his title “Israeli Boxing Champion” and a one-way ticket, Merhav Mohar takes off for the U.S. Leaving behind anxious parents, lots of friends and more than a few fans he sets out to realize his dream of becoming the boxing champion of the world. The documentary follows Merhav to New York where he works out daily at Gleason’s Gym in Brooklyn. His trainer, Hector Rocca, has turned out a number of world champions and has decided to bet on Merhav to be his next success. After a major triumph in a match in Las Vegas Merhav gets to the most important fight of his career – his first fight for the world championship. He steps into the ring wrapped in an Israeli flag. The match, however, becomes an unexpected and painful turning point in his life. “For deep understanding of the documentary form, for a description of a real character whom one can identify easily, for a drama build up and high level of direction and editing”. This entry was posted in Film, Judaica on December 5, 2012 by Amos.